The most common place where cars and pedestrians tend to interact is at intersections. Usually, there are marked crosswalks that pedestrians should be using as well as crossing signals that help manage the flow of pedestrian traffic in conjunction with the flow of vehicle traffic. However, most states also indicate in their vehicle codes that even when unmarked, there are technically crosswalks at any intersection. Therefore, even without a marked crosswalk or traffic signals, it pays to be particularly attentive to the presence of pedestrians at any intersection, especially if making a right turn on red. This is one of the situations that results in the most vehicle-pedestrian contact and is one maneuver that drivers need to take extra care when executing. Additionally, blocking the crosswalk is a ticketable offense in most jurisdictions so take extra care to make sure your vehicle is not blocking any part of one. If you are unable to cross the intersection or complete your turn without blocking the crosswalk and/or the intersection, then just be patient and wait for the next cycle of the light. Slightly less frequent, but still a common occurrence, is the interaction of drivers with pedestrians at entrances to driveways or parking lots. Here, drivers must always yield to pedestrian traffic because, more likely than not, you will be crossing the sidewalk to enter the destination. To make sure that you are not being a nuisance to traffic, plan ahead and move your car as far out of the active traffic lane as possible. Make sure to use your turn signal to indicate both to traffic behind you as well as approaching pedestrians that you are planning on entering the driveway or parking lot. The same applies when exiting. If visibility is poor, due to cars parked along the street, wait until there is a sufficient break in the flow of pedestrian traffic before inching out to get a better view. If traffic on the road is backed up, make every effort not to wait and not block the sidewalk. These seem particularly popular here in the Boston area. On longer blocks in the city and surrounding suburbs, there will frequently be a crosswalk that appears about mid-block. Usually, these have no signals and are denoted by little more than a few lines on the ground and some signage. Drivers should take extra care when approaching these and should make an effort to reduce speed in anticipation of needing to come to a stop. 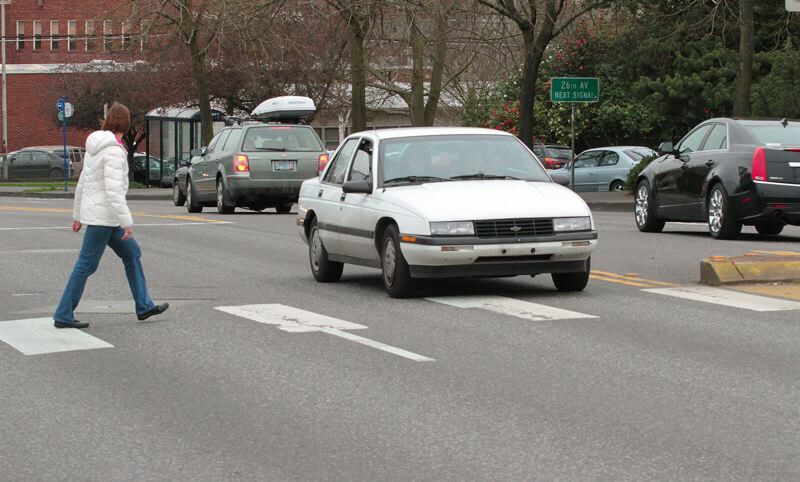 As you approach, keep your eyes scanning on both sides of the road and if you see a pedestrian step off of the sidewalk and onto the roadway, it is your obligation to make every effort to bring your car safely to a stop. In most places, failure to yield to a pedestrian in a crosswalk is a ticketable offense. If you are unable to stop, make an effort to signal a reduction in your speed and help the person behind you come to a stop to be in compliance with the law. These common scenarios are ones that I suspect most drivers come across rather frequently and probably do not give much thought to. However, they are also some of the most dangerous places for pedestrians precisely because of the interaction with a two-ton vehicle. By taking a few extra precautions and being extra patient, we drivers can help do our part to keep all manners of traffic flowing smoothly and safely. Going forward, we can only hope that city planners will be smart enough to start to take more road users into account when designing roads and instead of providing these potentially dangerous interaction points can find ways to provide dedicated pathways to separate pedestrian and vehicle traffic all together. As for our rather petulant cab driver, he was fortunate that the driver of the Mercedes was reaching for a badge and not a firearm. The man driving the Mercedes turned out to be an undercover police officer and was pretty thoroughly pissed off by the actions of the cab driver. As the light changed and I continued on my way to work, I could hear the officer behind me berating the cab driver and reminding him about his obligations to yield to pedestrians. Let that serve as a reminder that pedestrian safety is a very serious issue and one that we all can do a better job of keeping top-of-mind.